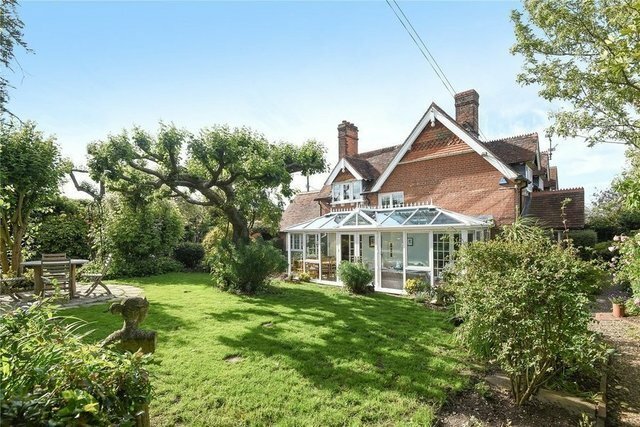 A charming Victorian period house within an Area of Outstanding Natural Beauty, The Old School House was originally part of the Lockinge Estate and is built of mellow brick, with tiled pitched roofs and attractive eaves. With impressive proportions, it is full of character, light and airy. Sensitively extended and double-glazed throughout, the pretty, manageable gardens overlook adjoining farmland at the edge of the Berkshire Downs. There are five bedrooms, three of which are on the upper floor. The master suite has an ensuite shower/dressing room and there is a spacious family bathroom. The ground floor has a spacious kitchen/ breakfast room and characterful drawing room, both of which open onto the conservatory and then onto the gardens. Its extensive, flexible accommodation would be ideal for a large family, or for a family with elderly parents, for running a business from home, or for a nanny, independent teenagers or house guests. The annex on the ground floor is currently incorporated into the main house or, with its own entrance, could be a separate entity. Access to the property is via a pair of timber five bar gates which open onto a gravel driveway affording ample parking for several cars, leading to a further gate, adding additional security to the garden, and leading to the rear of the property and further parking. The secluded garden is mostly laid to lawn surrounded by mature shrub and herbaceous borders. A thick beech hedge, low enough to enjoy the rural views, borders the garden, separating The Old School House from the adjoining farmland and pathways, accessed through a gate. There is a circular patio set within the lawn which is ideal for al fresco dining. A spacious timber barn, with mains water/electricity supply, provides useful storage. Next to the barn is an open fronted log/bicycle store with independent power supply, plus a greenhouse and vegetable patch. Garden tools are kept in the dry ‘privy'.